Robert Galbraith: new website for Strike series start tonight. The link goes to http://robert-galbraith.com/. The site has links going back to 2015 and the release of Career of Evil; I’ve been to it several times the last few days in search of a quotation I was tasked to find (about which more on another day) and, if there have been any changes, I haven’t noticed. Perhaps the bulletin from ‘Daily Snitch’ is that there will be changes and an imminent remodel? 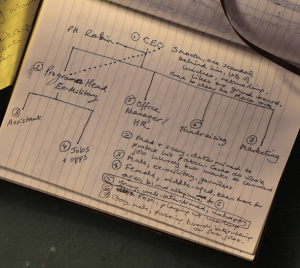 First, the notebook with a diagram in Rowling’s hand-writing (screen capture on left). It is the schematic of responsibilities in a small business; Robin is on the chart as the PA to the CEO. There are character thumbnail sketches keyed to each position on the chart. I think there is a natural, unforced conclusion from this chart, as it isn’t something in any of the first three books: the chart is Rowling’s working picture of a Lethal White plot point. Either Robin is leaving Strike’s employ in Lethal White or she is embedded in the charted firm as Strike’s partner to find out who the baddie is in that company. Which is a fairly big reveal, no? #5, the Office Manager/HR, has his thumbnail circled: “young, well-intentioned, unhappy.” The CEO and the Programs Head sketches read like living workplace nightmares, almost certainly cartoon misogynists. Everyone else is a cipher. I confess to being intrigued by Robin being back on the job, either with Cormoran, meaning their split at the end of Career was resolved, or on her own, which is a wonderful possibility, no? Robin, Private Investigator, one who is not a side-kick? 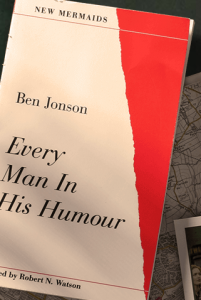 Second revelatory clue, the book cover on the site: Ben Jonson’s Every Man in his Humour. Oxford’s Research Fellow and Lecturer in Renaissance Literature Beatrice Groves is on holiday for a week so we cannot ask our best bet for an expert answer to this question. Humour is not Jacobean Revenge Drama. 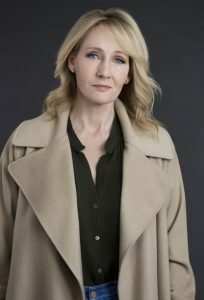 It may, though, very well be Menippean Satire, what it sounds like Jonson is after, albeit in drama rather than a novel, and certainly the kind of parody and take-down humor that Rowling enjoys (remember, she asked her interviewer in Carnegie Hall in 2012 if she thought Casual Vacancy was “funny;” Rowling thought Vacancy was a comic novel…). So, if these two revelatory clues are not red herrings tossed out for Rowling’s “narrative misdirection,” i.e., sadistic toying with readers lacking real lives, we might assume that (a) Robin will be ‘playing a role’ inside the character’s role we watch her play in the Cormoran Strike over-arching drama, mise en abyme, and (b) the chapter epigraphs will be from Ben Jonson and his contemporaries – or maybe satirists throughout the ages. I tend to think (hope?) that Robin does some undercover work in this. The question is, if this is indeed a plot detail, and it will center around some bureaucratic business office, then how does this play into the title of “Lethal White”? If the setting is inter-office crime politics, then the immediate idea I get is a callback to doped up settings of many 80s films, like “Wall Street”. At least that is the most familiar straw I can think to grab onto. Here’s a hopeful vote that the ‘lethal’ and the ‘white’ are both about the killer drug that goes by that name rather than a reference to dangerous (?) white-collar crime or to the guilt of all those born ‘white’ for colonial crimes, the subjection by force of native peoples, et cetera.